I am stuck at the Newark Airport, having my 5PM flight for Montreal cancelled, waiting for the next one at 8:25PM. It gives me time to relax, and rip a few CDs… The news concerning CommeLesChinois.ca are that it is no longer blocked in China! The reasons why it was unavailable in the first place remain obscure. My friends in China said that it had been blocked before I had even started adding contents to the site. The machine hosting this site (twiddle at dreamhost.com) was always the same. So, it was while browsing this site’s stats that I found out that I had hits from Mainland China. Someone in Shanghai googled my site out on the Tous les jours bakery boycott story, on April 28th, 2008. An unrelated tale from the Wall, the Radio-Canada.ca was once again (presumably) banned last week, according to my own “investigation”, confirmed by Radio-Canada’s tech columnist. Je suis pogné à l’aéroport de Newark, après que mon vol à 17h vers Montréal ait été annulé, en attendant le prochain à 20h25. Ça me donne le temps de relaxer et ripper une coupe de CDs… Et les nouvelles concernant CommeLesChinois.ca sont que ce n’est plus bloqué en Chine! Pourquoi ce n’était pas accessible initialement, je n’en sais rien. Mes amis en China m’ont dit que c’était bloqué avant même que je ne commence à ajouter du contenu au site. La machine qui héberge le site (twiddle à dreamhost.com) a toujours été la même. C’est en regardant les stats du site que je me suis rendu compte de hits venant de Chine Continentale. Quelqu’un à Shanghai avait alors trouvé, le 28 avril 2008, mon article sur le boycott du café Tous les jours. Une nouvelle à part en provenance du mur: Radio-Canada.ca est à nouveau (présumément) banni en Chine depuis la semaine dernière, selon ma propre “enquête”, confirmé par Bruno Guglielminetti dans sa chronique techno. Après au moins six mois à être bloqué en Chine, le site web de Radio-Canada était à nouveau accessible aux internautes basés en Chine continentale. Une semaine après l’envoi d’une lettre par Hubert T. Lacroix, président de CBC/Radio-Canada, à l’ambassade chinoise à Ottawa, les Chinois pouvaient à nouveau cliquer sur Radio-Canada.ca et CBC.ca (voir article). Voilà qu’en voyage de deux jours dans la province du Guangdong, j’ai remarqué à Shenzhen hier (7 mai 2008 – vers midi, HKT) que Radio-Canada.ca n’était plus accessible. 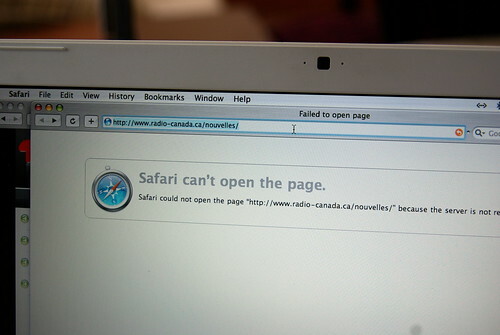 Un “server not responding” apparaissait en pointant sur le portail de Radio-Canada ou son site de nouvelles, tandis que CBC.ca répondait encore à l’appel. Une défaillance du routage? Un blocage temporaire automatisé par mot-clés? Le pare-feu qui tombe à nouveau? Deux amis vivant à Beijing m’ont confirmé plus tard aujourd’hui (8 mai 2008 – le soir) qu’ils ne pouvaient pas accéder à Radio-Canada.ca non plus. What made the news in Hong Kong on May 1st wasn’t the Labour Day march, but rather this bus crash out in the New Territories burgh of Sai Kung. 17 people died and 45 more were injured. This comes another transport accident, involving two trains colliding in Shandong province, with one of the trains on a high-speed route between Beijing and the port town of Qingdao, where sailing events for the Olympics are to be held. 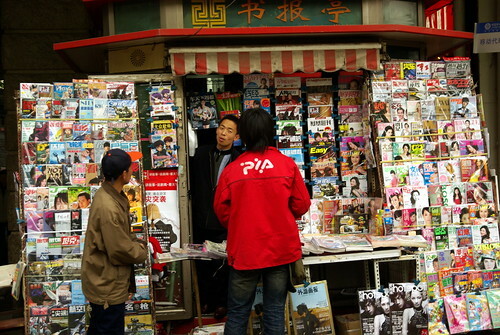 Perhaps you would think that Beijing is an international city, and that you could easily find newspaper stands or bookstores to hold your favourite magazines. I pretty much gave up on it, a week and a half in Beijing. 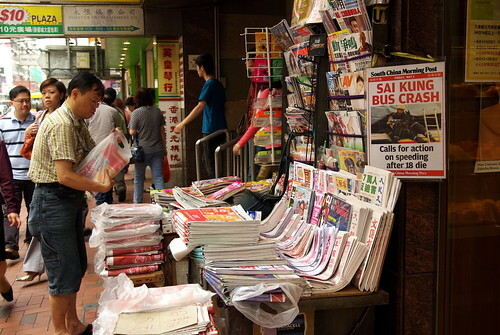 I knew that in a Chinese-language speaking city, there is not much incentive to hold expensive, foreign-imported magazines (where one copy of the Economist equals 35 times the price of the China Daily’s English edition). (See recent survey published by the HKU POP) ESWN brought my attention to this opinion poll conducted by the University of Hong Kong. Other than that, what has been in the news lately? – A queer histoire de moeurs involving the “Prince of White Flower Oil”, Stephen Gan, who was accused of sexual harassment on a local taxi driver. – Ma Ying-jeou. 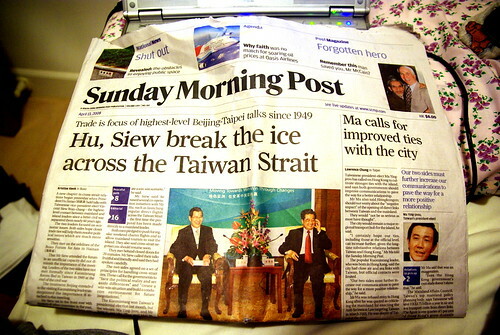 The president-elect of the Republic of China (Taiwan) is always in the news. His vice-president visited Hainan province in the PRC, and met with Chinese president Hu Jintao in what was called the highest summit meeting between the two sides since 1949. We predict that Ma will visit the Mainland sometime during his first term. Major stuff. – The open space debate has been raging for weeks before I arrived in Hong Kong. Private developers (housing, commercial) control land that does not belong to them, but that is rather considered “public space”. We talk about plazas, the pavement, the street and all that, which is normally “public”, but is under the jurisdiction of private companies that define rules for them as if it were their own. Times Square, a popular shopping mall in Hong Kong, is at the middle of the media storm. 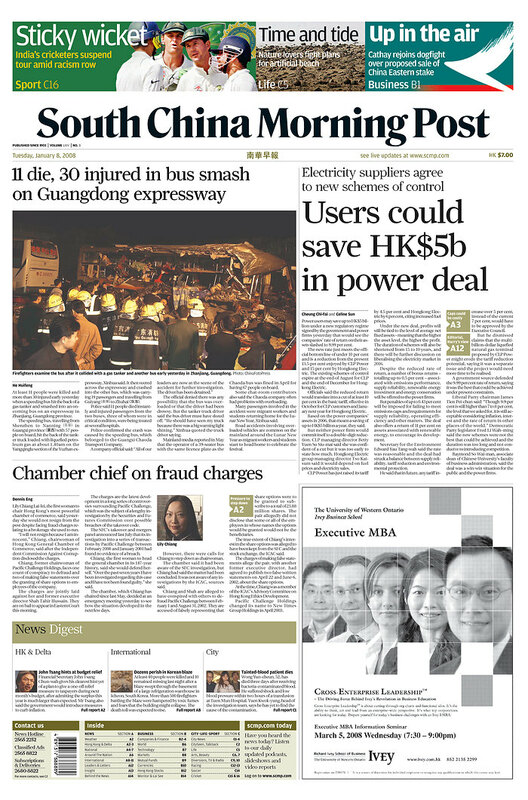 It’s a shame that I don’t have the time to take more photographs of the South China Morning Post, the most-respected English-language newspaper in Hong Kong. I think that their editorials and opinion texts are 100 times more balanced than what we read in North America or Europe, with respect to particular current events. We also do take things with grains of salt, and hope that this will not degenerate into a new episode of the Clash of Civilizations. Un chapitre de l’histoire des photos explicites à Hong Kong se termine aujourd’hui par cette conférence de presse donnée par Edison Chen. Nous en faisons mention sur ce blogue, parce que la presse canadienne (exceptée un article ou deux sur Canada.com, en provenance du Vancouver Sun bien sûr) n’en a tout simplement pas parlé. 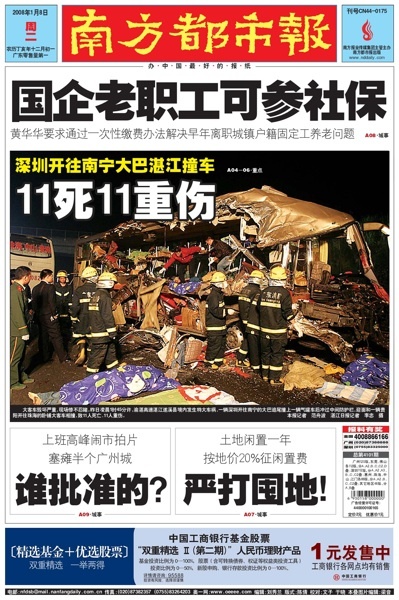 Pourtant, ça a fait les couvertures de journaux pendant plus de deux semaines consécutives, et on parle de publications généralement considérées crédibles, comme le Ming Pao ou le Sing Tao. Au delà de anecdotique, cette affaire marquera les mentalités dans le monde sinophone. Aussi, c’est un fait intéressant qu’Edison fasse sa déclaration entièrement en anglais. Il a fait sa marque comme acteur, chanteur, modèle à Hong Kong, mais a grandi à Vancouver. La conférence de presse a également eu lieu la même journée que celle donnée par Ching Cheong, un journaliste originaire de Hong Kong travaillant pour le Straits Times de Singapour, libéré au début du mois après avoir été emprisonné par Beijing depuis 2005. “My Chinese face came as an advantage”, says 54-year old HU Xian (胡宪), a reporter for Chinese-language newspaper Sept Days (七天网) who just returned from an assignment in Kabul, and who will be telling her story at a seminar organized at the Montreal Chinese Cultural Centre on February 10th. When the Canadian Defence Ministry invited Sept Days to send a journalist to Afghanistan, and later withdrew it (on the basis that it was becoming too dangerous), the Montreal-based weekly decided to send Hu anyways on an assignment to one of the most dangerous countries in the world. She set off for Kabul and arrived there by plane on December 20th, 2007, forgoing the original plan to fly into China and take a land route (impracticable because of the winter). Unlike surely most other Canadian journalists who were in Afghanistan in the past years, she was not embedded with Canadian troops, and could thus freely go wherever she wanted to – as long as it was in Kabul. Her Chinese appearance, and the fact that she is a woman, gave her special access to local folk that she met, which included Afghan women and private residences. 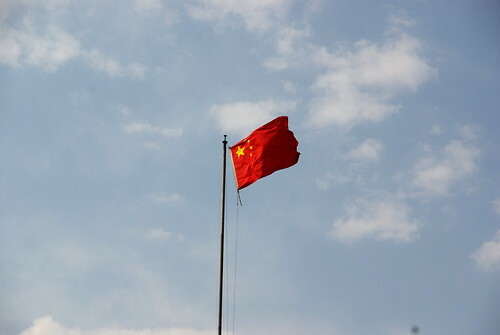 Early last summer, Hu started looking into the opinion of new immigrants of Chinese origin, whose numbers in Canada are exploding in the past decade, on the war in Afghanistan. “I wanted to see what Chinese people (in Montreal) thought of the war. So in July, I interviewed over 70 people and realized that 79% of the respondents were against the Canadian presence in that country”, tells the journalist who emigrated to Canada 18 years ago, and obtained citizenship two years later. 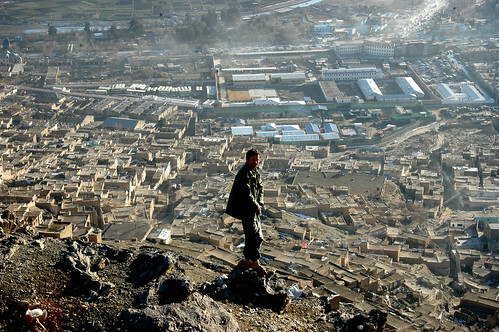 According to opinion polls published in summer 2007 (Radio-Canada.ca), 1 out of 2 Canadians disapproved of the war in Afghanistan, while this proportion reaches two-thirds in Quebec. “I think that Chinese people, we have our own values, and there must be something about this”, which certainly echoes the justification given by many Quebecers who don’t support the conflict. 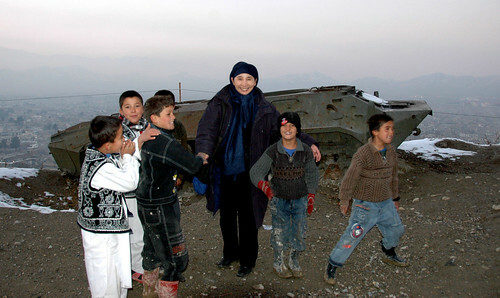 In Kabul, Ms. Hu stayed with friends of friends, journalists from China who came after the war. Through these contacts, she encountered a whole set of the local population, among which were a Chinese restaurant owner (who was Chinese), war widows running a carpentry centre and even the only Afghani female pilot (since her sister died), who flew a chopper. The first article that Hu wrote upon her return was her change of opinion about the burqa, the traditional Afghan dress covering their wearers under them. Hu recalls: “Of course, I originally thought that the burqa was a symbol of oppression.” She met women in the city who were not happy when questioned about their wearing of the burqa. In the mountains, a woman said that her grandmother and mother wore it, that she wore it by choice, and that it was appropriate in her mind that she should “only be pretty for their husband”. In last week’s edition of Sept Days, the former university lecturer recalls her interview with a local journalist, whose first words to her were “Afghanistan’s situation is terrible“. Sept Days expects a mainly Chinese-speaking audience to attend. However, her series of articles definitely reaches to mainstream society: “We have an opinion; we pay taxes too! What we want to say is that we are there too”. HU Xian will be speaking at the 200-seat auditorium at the Montreal Cultural Centre in Chinatown (1088 Clark). She took over a hundred pictures while in Kabul, some of which will be showcased during the event. February 10th, 2008, 3 to 5PM. Tickets are 20$ on pre-sale and 30$ at the door. Half-price for students. Information (PDF file). « Mon visage chinois fût certainement un avantage », raconte HU Xian (胡宪), une journaliste de 54 ans pour le journal chinois Sept Days (七天网), juste de retour d’un voyage à Kaboul, et qui expliquera son histoire à une conférence organisée au Centre Culturel de Montréal, le 10 février prochain. Après que le Ministère de la Défense du Canada eût invité Sept Days en Afghanistan, puis ensuite retiré l’offre (prétextant que le climat devenait trop volatile en Afghanistan), l’hebdomadaire montréalais décida de quand même envoyer Mme. Hu en reportage dans l’un des pays les plus dangereux du monde. Elle partit pour Kaboul et arriva en avion le 20 décembre 2007, laissant de côté le plan original de s’envoler vers la Chine et d’emprunter une voie terrestre (impraticable à cause de l’hiver). Contrairement à la plupart des journalistes canadiens partis en Afghanistan ces derniers temps, elle ne fût pas insérée dans une unité des forces canadiennes, et pouvait donc se balader où elle voulait – en autant que ça soit à l’intérieur de Kaboul. Son apparence chinoise, et puis le fait qu’elle soit une femme, lui donna un accès spécial chez les habitants qu’elle rencontra, incluant aux femmes afghanes et à des résidences privées. Tôt l’été passé, Hu a commencé à se questionner sur l’opinion de la guerre en Afghanistan des nouveaux immigrants d’origine chinoise, dont les chiffres ont explosé lors de la dernière décennie. « Je voulais savoir ce que les Chinois (à Montréal) pensaient de la guerre. Alors, en juillet, j’ai interviewé 70 personnes et j’ai réalisé que 79% des répondants étaient contre la présence canadienne dans ce pays », dit la journaliste qui est arrivée au Canada il y a 18 ans, et est devenue citoyenne deux ans plus tard. Selon des sondages publiés lors de l’été 2007 (Radio-Canada.ca), 1 Canadien sur 2 était en désaccord avec la guerre en Afghanistan, tandis que cette proportion atteignait les deux-tiers au Québec. « Je pense que les Chinois, nous avons nos propres valeurs, qu’il doit y avoir quelque chose par rapport à cela », ce qui fait écho au discours des opposants à la guerre dans la population québécoise. À Kaboul, Mme Hu est demeurée chez des amis d’amis, des journalistes de Chine qui sont venus après la guerre. À travers ces contacts, elle a pu rencontrer tout un échantillon de la population locale, incluant un propriétaire de restaurant chinois (qui était chinois), des veuves de la guerre opérant un centre de charpenterie, et même la seule femme pilote d’hélicoptère afghane (depuis que sa soeur est morte). HU Xian donnera une conférence à l’auditorium de 200 places au Centre Culturel de Montréal dans le Quartier Chinois (1088 Clark). Elle a pris plus d’une centaine de photos à Kaboul, dont quelques-unes seront présentées lors de l’événement. 10 février 2008, de 15 h à 17 h. Les billets sont 20$ en prévente, et 30$ à la porte. Moitié-prix pour les étudiants. Information (Fichier PDF). Un article de la Presse Canadienne publié le 9 janvier 2008 rapporte la présentation de la très succinctement titrée « Célébration du Nouvel An chinois 2008 » les 15, 16 et 17 janvier 2008. Il ne fait cependant pas la mention des liens, pourtant avoués des organisateurs (voir entrevue du Mirror), avec la secte Falun Gong. Cet article dans le Los Angeles Times fait état de la controverse aux États-Unis, où la Célébration est appelée Chinese New Year Spectacular. 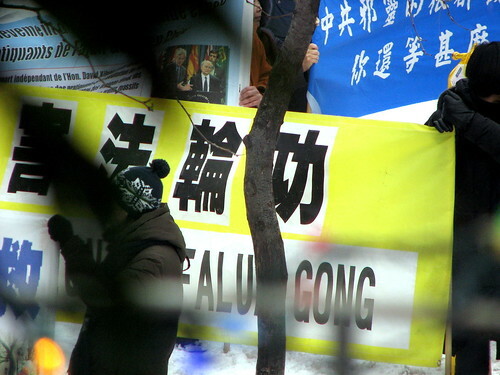 Les organisateurs se défendent que le spectacle soit organisé par le Falun Gong, étant financé par le New Tang Dynasty TV et des donateurs privés. Le problème n’est pas tant le fait que des organisations religieuses, légitimes ou non, organisent des spectacles pour le grand public (qui est libre d’y aller, ou de voter avec ses jambes). C’est plutôt le petit bout d’information manquante qui choquerait les lecteurs francophones qui s’en préoccuperaient. En fait, mes amis iront à la place (et il y a eu un moment de confusion quand ils m’y ont invité) au « Gala du Nouvel An chinois 2008 », les 2 et 3 février à l’Université Concordia. Contrairement à l’autre spectacle, celui-ci ne semble pas avoir assez de ressources pour se payer un vrai site web à lui (et doit faire de l’auto-stop avec le portail Sino-Québec), ou juste de l’information en français. Les affiches se ressemblent pas mal, en tout cas ?